Follow our advice to come to Sanfermin if you want to get the most out of the fiestas. You can find a hotel, a rented room or even come as a backpacker, but what you really need to know is how the party scene and the fiestas really thrill and buzz. Eat enough to stand alive! 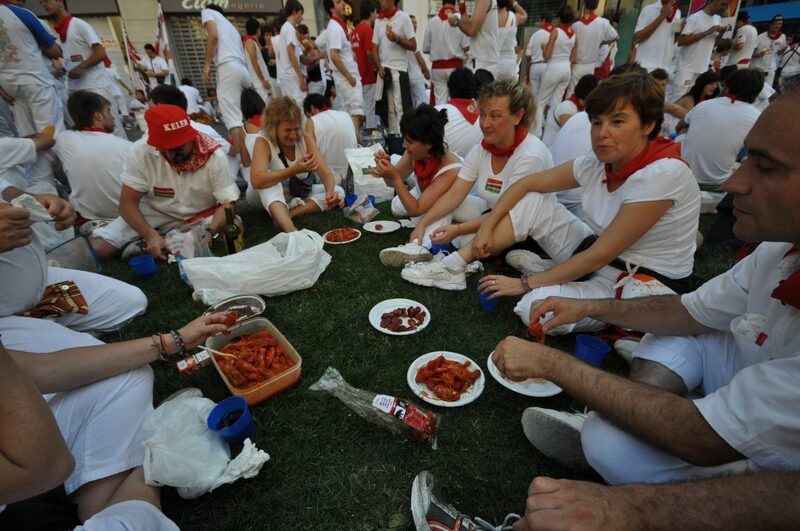 One of the characteristics of the fiesta is that everyone dresses up as they please…, but in white gear. This is not an inconvenience but rather one of the inside ways of becoming more intimate with the fiesta spirit and allowing you to party better by mixing in better with the rest of the crowd. So, the first piece of advice is to dress in white trousers or shorts or whatever, – in white – and also with a white shirt, tee shirt, or whatever. A minimum item and pretty much a must is the characteristic red necktie. All the clothes stores are selling in Kukuxumusu before and during the fiestas and they are also widely available at street markets. In addition, it pays to wear some good quality footwear. Flip-flops and sandals are not very suitable as it is easy to step on broken glass or simply have people step on you as there are big crowds just about everywhere. Just as we advise you to let things unfold at their own time to enjoy the fiestas; we equally advise the opposite if you are planning a trip to Pamplona. You should make sure you have travel tickets to get to Pamplona well beforehand. It is also well worthwhile ensuring you have a place to sleep before you come. Accommodation basically comes down to hotels, renting apartments or going to camping sites. We would heartily recommend going for regulated accommodation as service and quality are guaranteed. However, it may be necessary to fall back on private rented accommodation because demand is so high. You can make hotel bookings at Findor.com, with a 24 hour attention service and in your own language. 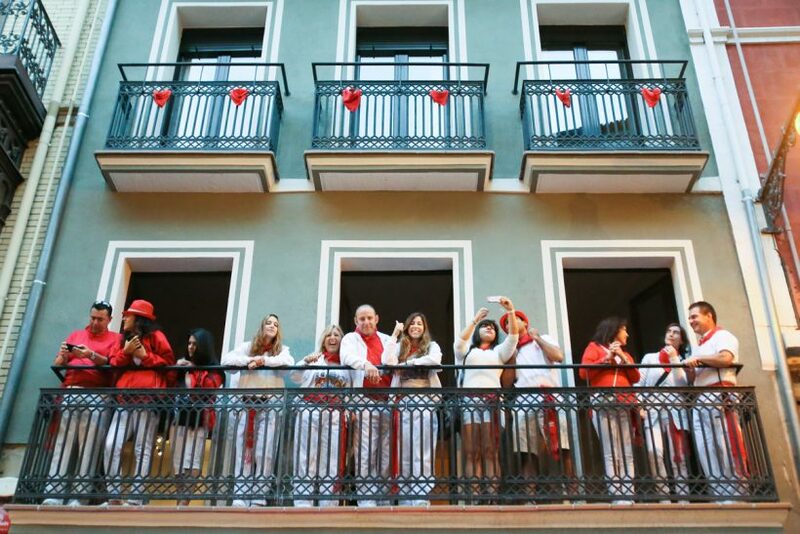 You can also find some tourist package offers at Sanfermin Booking where you can book a balcony from which to watch the Running of the Bulls. You could also check out our own noticeboard for private apartment renting. The best way of keeping in form during all the partying is to make sure to eat plenty. The best thing would be to follow the locals in their habits of eating a breakfast, a mid-morning snack, a meal, an evening snack and a late dinner. There is a very wide range of offers in food during Sanfermin. From Monday thru Friday supermarkets are open but on Sundays and on the 7th of July, they are closed to the public as this is a holiday in Pamplona. However, even on those two days some small food stores would be open around the old part of the city. While there is a wide range of restaurants, there are also some street traders at places such as -Antoniutti and Barracas- and ordinary bars that would provide some basic food and snacks or pinchos. In Sanfermin, you can expect to pay a bit more than during the rest of the year so it is a good idea to ask the price before ordering. The city doubles its number of inhabitants during Sanfermin and the hotel vacancies are all filled, especially at weekends. It is permitted to sleep out in the parks and such public places but it can get cold at night (14-22 Cº) and sometimes it could rain. 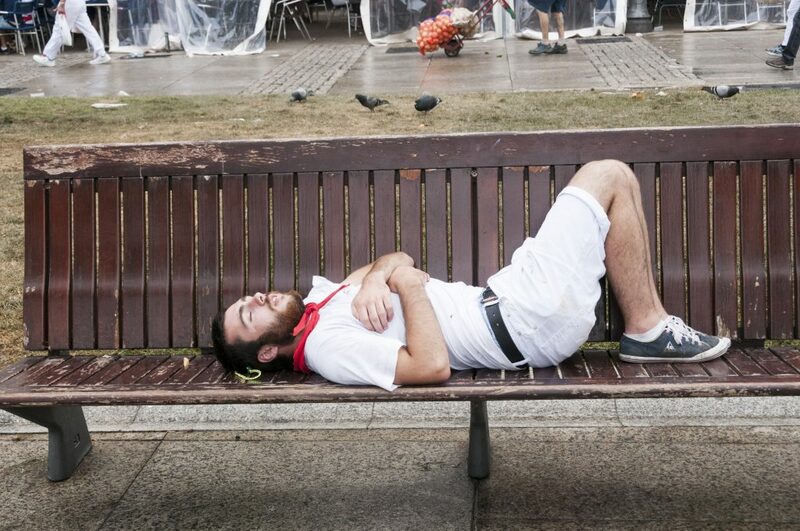 There are several options for sleeping in Sanfermin. From the most expensive to the cheapest in the following order: hotels, hostels, boarding-houses, camp sites, renting an apartment, renting a room and maybe just not sleeping or sleeping on the ground in some public park or similar. The best thing would be to make an early booking. It is also quite customary to rent out apartments or rooms in Sanfermin. At our Notice-BoardSanfermin.com you can usually find people who are offering and searching for places. Sanfermin Booking (Powered by sanfermin by locals & Sanfermin.com) offers various packets that could be of interest as they are varied and open to different kinds of travelers. You can book the balconies to the running of the bulls too. If you can book hotel rooms or flights to Pamplona you can visit travel.sanfermin.com (Powered by Findor & Orbitz). If ever an issue arises you can call or email Findor team at any time (Live Chat & Voice). They’re always available and ready to help. There are two Left Luggage Offices during Sanfermin where all sorts of equipment and baggage may be left. The biggest and cheapest is the one that Pamplona City Hall organizes each year at the public school of San Francisco, in the city center. It is always open from the 4th of July until the 16th of July. Spanish, English, Basque language and French and German are all spoken by some or other of the attendants. There are also changing rooms available there if you want to make a quick change of clothing. There is also a tourist information office. Price per item of baggage or equipment for each 24 hours is about 4,5 euro. If you do take it out to have a change of clothes or whatever, then you are charged again when you put it back for safekeeping. When you leave in your pack they make a photocopy of your passport and they give you a receipt and a tag and they will charge you for the first day. To take out the pack you will need to show your passport and your tag and they check off your data with the photocopy that goes with the pack. This is the safest and best system. There are also two rows of automatic storage lockers at the Pamplona Coach Station which work with coin slots and if you arrive by coach this might be a handier option. 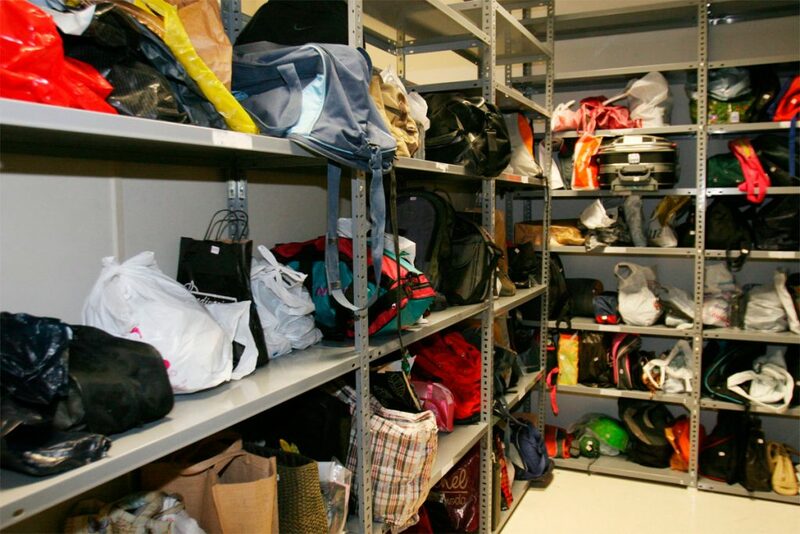 There is a lost property service available at the local police station where everything picked up in the city is handed in and the public can come to check the articles. When someone gets so caught up in all the partying, it is sometimes difficult to keep a close eye on one’s things. If something gets lost, hopefully some honest citizen who finds it will hand it over to the municipal police or to one of the collaborators in civil protection – those people wearing an orange-colored jacket – who will see that it finds it way to the Lost Property Office. Pamplona during Sanfermin fiestas has some special premises, both public and private, where you can shower. After being out on the town during Sanfermin the moment comes when it is necessary to have a wash. There is a large public facility – the Casa de Baños y lavandería Pública available in the old part of town which where showers are available. This premises is located in the street – calle Hilarion Eslava 9, – very closet o the left luggage premises at San Francisco square. The best thing about using this public center is that towels and soap are also available so that it is not necessary to carry anything with you. Many visitors avail of the public swimming pools to have a relaxing swim and do some sunbathing in the quieter hours of the day before the partying takes off again. 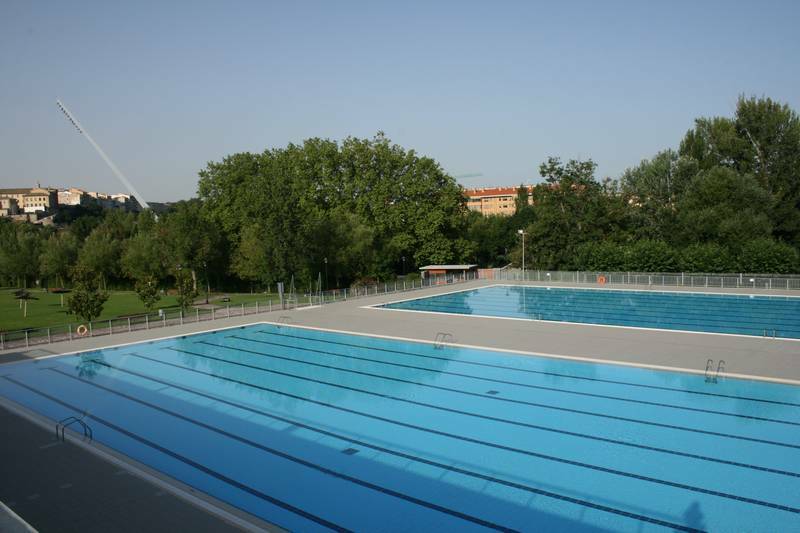 The swimming pools in the Piscinas de Aranzadi, are public and reasonably close to the whole part of town. There you will find open air and indoor pools as well as a gym, dressing rooms, some green areas for sunbathing and even a restaurant. Pamplona in San Fermin has a name for being anarchic -a place where- during the days of the Fiesta – anything goes. And that first impression, when you see the whole town in celebration, seems to conform this fact. However, it’s not quite true. Any misdemeanours are punished, just as in any other place, with a night in the caboose, or a fine or whatever. Proof that things are never too unruly is that you will see many young children with their families strolling among all the hustle and bustle. They can be seen, for example, at the exit of the “Peñas” to see how people “enjoy” themselves. Or at the “Dianas” to see the survivors from the all-night sessions. Stepping over the line might sometimes depend on where and when you misbehave. It’s a question of using your instinct and being generally prudent at all times. Adapting and accepting the local norms and learning from what you see around you. 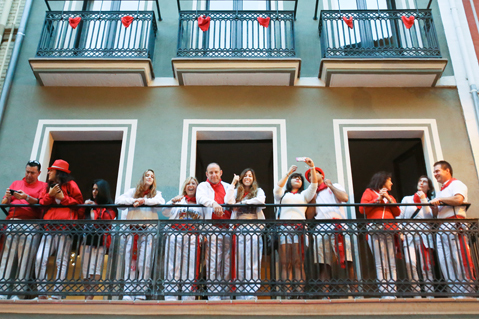 The Sanfermin.com offers include a guide and a breakfast and this offer can be further extended to include other activities such as a Tour of the Bullrunning Course or reserving a select viewing spot from which to watch the nightly fireworks display from the roof terrace of the Baluarte Building. Check out our Web Page and learn more about our team as well as our offers and products.